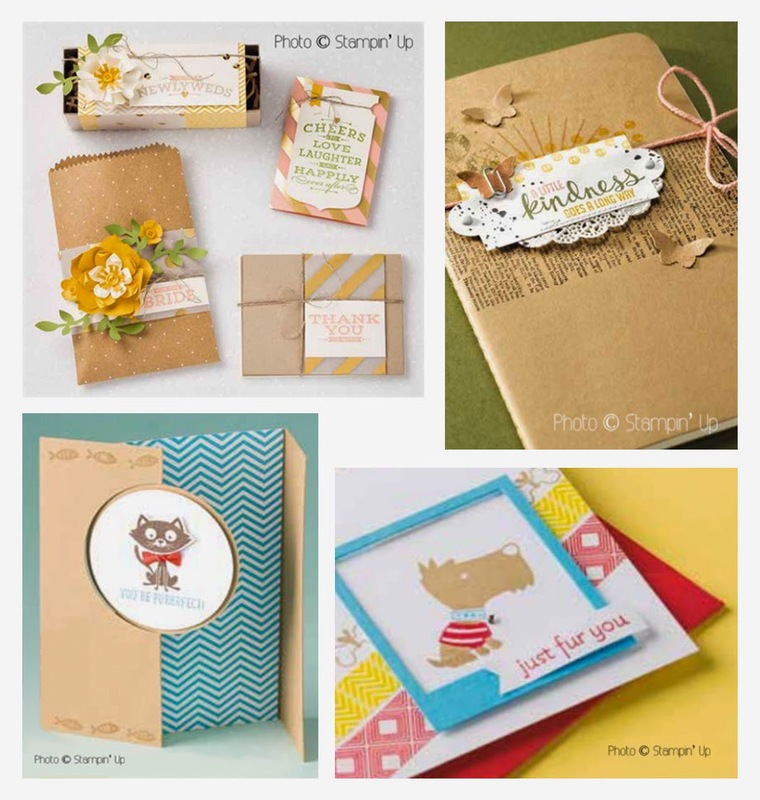 Stampin' Up ideas and supplies from Vicky at Crafting Clare's Paper Moments: Order from the brand new Stampin' Up annual catalogue today, see new products, win prizes! 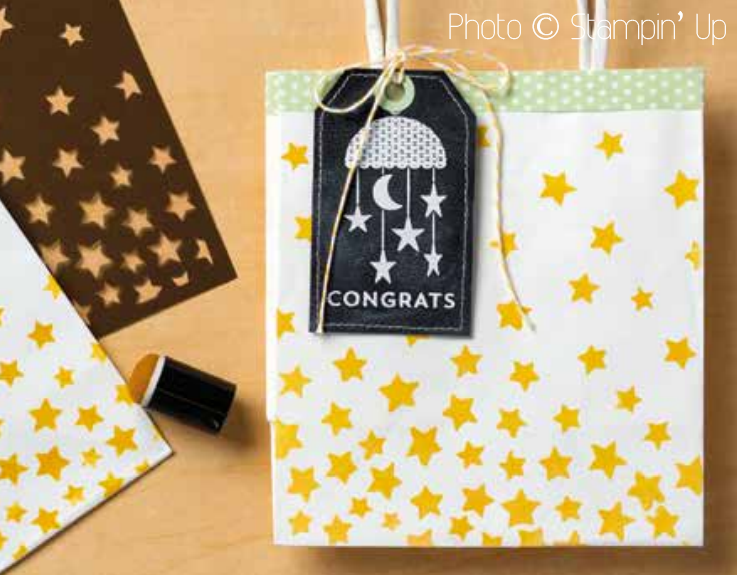 Order from the brand new Stampin' Up annual catalogue today, see new products, win prizes! Today is a special Stampin' Up day and I'm delighted you're here! It's the day that the brand new Stampin' Up annual catalogue 2104-2015 goes live and you can start ordering all the exciting new products! There's lots to see here, as well as not just one but two chances to win a prize - YAY! More about that later but first, get yourself a glass of champagne (!) relax and enjoy my catalogue launch! She's here - and isn't she beautiful?! This catalogue not only looks gorgeous but is practical too - it's indexed front and back to help you navigate its 249 glossy pages! As well as useful sections such as birthday, wedding, baby etc, you'll find areas dedicated to Gift Packaging, Artistic Expression and even Home Decor, all photographed beautifully. Your catalogue is a rich source of ideas and inspiration so add one to your order today, or order from me using the Paypal button in my blog sidebar. PS. If you want everything from the catalogue, you'd better join Stampin' Up! Click here to find out how. STUNNED BY STAMPIN' UP'S NEW STAMPS! And how about these new sets (projects by Stampin' Up's designers, clockwise from right) Kinda Eclectic, perfect for collages; Hot Diggety Dog, a cute set for dog lovers; one for cat people too, You Little Furball; and the superb new Cheers to Love for all things wedding related. There's even a special section of outline stamps for Blendability addicts (like me!) starting on p.167. But my new absolute number one favourite (at the moment) is Something for Baby! This set is not just for baby cards believe me! I have heaps of ideas for using it coming up next week, so don't miss that! FRANTIC FOR STAMPIN' UP'S PHOTOPOLYMER SETS! Isn't it fab?! There are no less than 19 different elements in this set and there are even coordinating framelits! Oh and if you buy the stamp set and framelits together, you save 15%! Isn't that what we love to hear?! WIN A BEAUTIFUL STAMPIN' UP PHOTOPOLYMER STAMP SET! 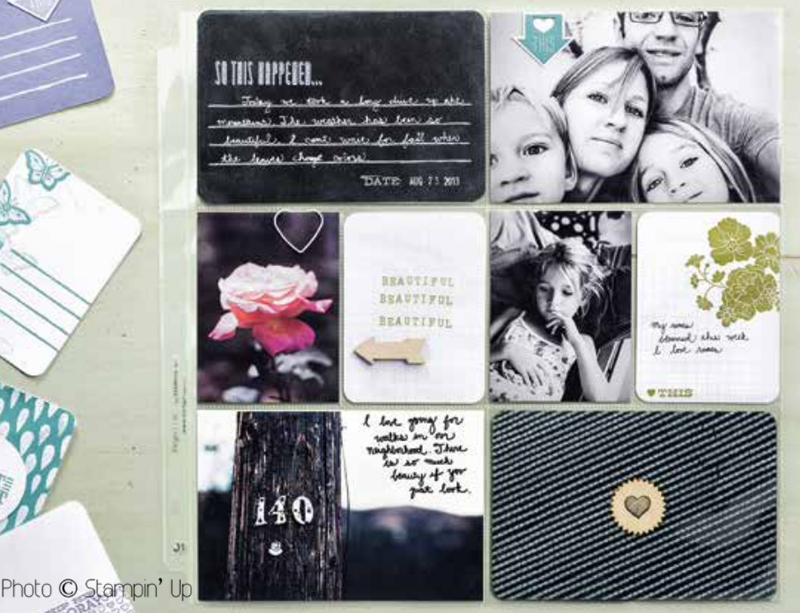 Would you like to try out a Stampin' Up Photopolmer set for yourself? For your chance to win this Show and Tell 2 stamp set, just leave a comment below before 5pm (BST on Friday. I'll use a random selector and will announce the winner at 10pm (BST) on Friday. Will it be YOU?!!! There's another chance to win a prize further down the page, so don't go away yet! SILLY ABOUT STAMPIN' UP SEQUINS! The 2013-2014 in-colours are favourites of mine with their cool ice-cream colours and I'm loving the current sequin trend. Put those things together and you get an exquisite new sequin assortment that has me squealing with excitement! MAD FOR STAMPIN' UP MASKS! Masking is another current trend wowing everyone in the craft industry at the moment and Stampin' Up has two brilliant sets of two: Hearts and Stars, and Dots and Stripes. Spray them or sponge them for different looks - they're great fun! 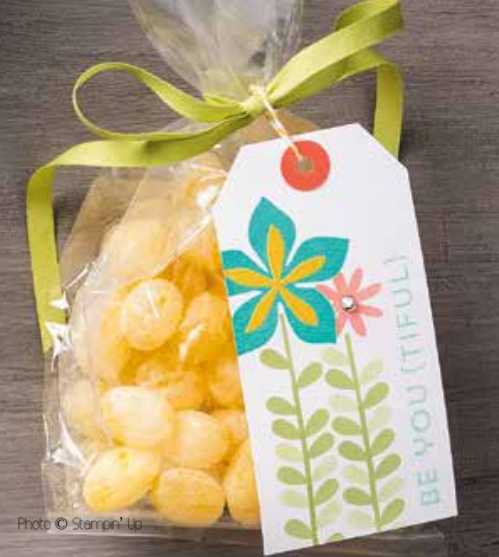 This little bag made by one of Stampin' Up's designers looks so effective! POTTY ABOUT STAMPIN' UP PROJECT LIFE! I just love the idea of popping photos in pockets, journaling on ready-made cards and adding colour-coordinated embellishments. Isn't this a beautiful page from the catalogue? And how about this sweet layout? If you never seem to have a minute to record your memories these days, you might find this easy Stampin' Up Project Life system is the answer! There are lots of stamp sets designed especially for Project Life which are also great for cardmaking - like Day to Day, a useful photopolymer set I used to make this card to celebrate the Stampin' Up new year! It would work for any special day of course and would make a great birthday card for teens or males, or an anniversary card for a guy that doesn't do hearts or frills! A good variety of designer paper is a must in any craft room for cards, 3D projects and gift wrapping. Stampin' Up has a wide range this year, from the vintage book style of Typeset to the bright Sweet Taffy and everything in between! There are two new versions of the popular small stacks too, ideal for card makers. The tag on this gift was made with a Blackberry Bliss honeycomb design from the Moonlight stack - and check out the lush matching ribbon too! IDIOTIC FOR STAMPIN' UP'S NEWEST IN-COLOURS! Introducing some new colour into your craftroom can really rev up your mojo! I've fallen in love with these fabulous new colours and have found they breathe new life into many of the existing colours too! Click here for my full intro to the 2014-2015 Stampin' Up in-colours. BANANAS FOR STAMPIN' UP'S BLENDABILITIES! These amazing, blendable alcohol markers are every bit as fabulous as I'd hoped! (Click here to see some of my samples.) If you want to add streak-free, air-brush style to your colouring arsenal, these are definitely for you. Blendabilities come in packs of three shades of a colour and there are six fabulous assortments available to buy now at £10.95 a pack: Cherry Cobbler, Coastal Cabana, Daffodil Delight, Old Olive, Pumpkin Pie, Rich Razzleberry, plus a pack of six Skin Tones £20.95. Memento black ink (£5.50) is available to use with the markers and a Colour Lifter (£4.50) to correct small mistakes and create highlights. More colour assortments will follow on the 1st August. WIN SOME FREE STAMPIN' UP BLENDABILITIES! I have this pack of the Coastal Cabana assortment just waiting for a loving home! If you'd like the chance to win it, just leave a comment below before 5pm (BST) on Friday, telling me how you'd like to use them. I'll use a random selector to announce the winner on Friday at 10pm (BST). Good luck! ... okay, okay, I'll stop! I have got heaps to show you in the coming weeks but for now, I'll let you get on with your shopping! ENJOY!!! My daughter is back from Glastonbury looking rather bohemian! Never mind Metallica or Kasabian, the star of the show was the amazing Dolly Parton according to my daughter! She had the crowd eating out of her hand with her music and her warmth and wit. The song Jolene was apparently written about some minx who'd had her eye on the star's husband but now, says Dolly: "Every time I look at him sleeping over there in his La-z-Boy, snoring, that hair turning grey at the temples, I wonder if Jolene is still around. I'll call her up and say, 'you come and get him now!'" Sometimes I don't know if I like your cards or your family stories the most! I just ordered some blendabilities in razzleberry and olive and can't wait to try them. I have a lot of floral stamps and am hoping to use them to color and blend my flowers. I hope I can catch on quickly! And I love your clover - a must project for sure!! I cannot wait to get my hands on the new goodies! I'm not sure if I'll be eligible for the giveaways with joining your team soon, (doesn't matter if I'm not) but here's my thoughts on both products The stamp set will be useful for so many projects that I can already see taking shape in my mind. Loving the look of the new catalogue the blend abilities sound great and will be perfect for colouring my stamped images especially my floral ones. Those stamps look great too. I always love to see what your catalogue shows and what you have done with the products. My reason for wanting these pens would be to try the markers as I don't have any, they may even persuade me to abandon computer colouring LOL. can't wait to use blendables on corner garden stamp!! Love those awesome arrows! Thanks for sharing your inspirations. I love the photopolymer stamps. I'm so happy SU came out with them and I love all those arrows! I love that your daughter liked Dolly Parton. She is a hoot, sweet and honest. I went to a new catalogue launch a week ago and got to play with a couple of the new products which was pretty exciting! So many lovely new products, each time I browse the catty, I find something else!!! Great post- thanks for sharing all these great tools and products! Thanks for the opportunity! New catty is great, but I love seeing what you do with all the products! Keep up the good work! There are so many new things in the katalog.... I love them all!!!!!!!!! Sending best wishes from Germany! 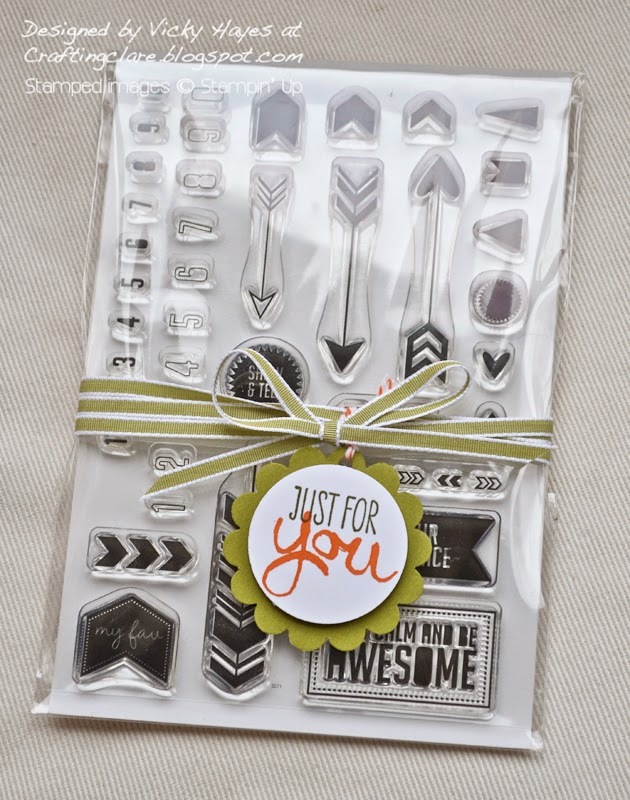 Stampin' Up is brilliant at coordinating all their products. The blendabilities look brilliant - can't wait to get my hands on them! Lots of lovely goodies and it's takes so long to make my mind up. I love the new stamp sets and a mask or two too. Lots of lovely goodies, it's so hard to make a choice. I love the new stamp sets....just ...which ones to have! Seriously Vicki....I am at a total loss as to where to start.....I hope you know that feeling. My catty is engorged with post it flags!! On a couple of occasions I have had to "step away fm the catalogue!!" 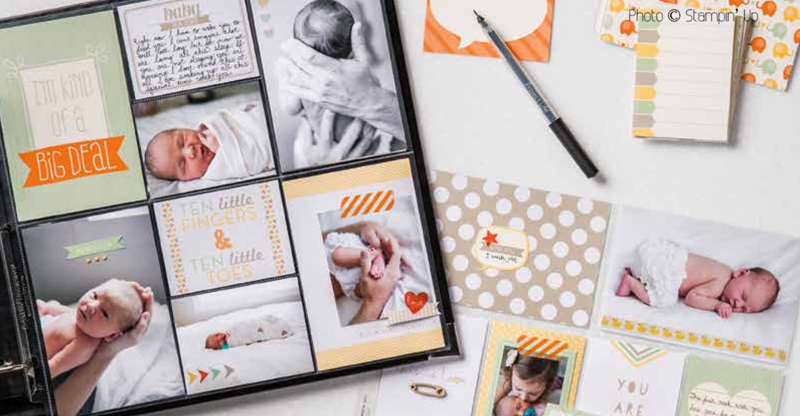 I love the cards and projects that you have features...esp the "Something for Baby" one....too cute. Love all these new products! Have not tried any alcohol ink pens yet so am excited that SU has them now. 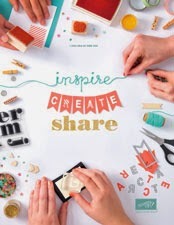 What a fab giveaway Vicky, loving those stamps:) I'm not a fan of colouring in but you have created some inspiring projects with the new blendabilities that I'd love to give them a go!